If you're a Net retailer hoping to beat the B2C odds this holiday season, why not tap the world's second-largest economy? First, though, learn how to "click" with the Japanese eshopper. The head of Intel Japan retired early to spend more time with his family. One of his favorite new hobbies: sending wireless Web startups sky high via the JPY 6.5 billion Mobile Internet Capital Fund. It took something as powerful as the New Economy to do it, but NTT's outrageously high interconnect fees are finally being lowered. Are mobile surfers boxed into a walled garden? IPv6 promises to refashion the Net, and this time the Japanese aren't letting the Americans make all the decisions. Our research editor is an avid i-mode user, so, to better understand the phenomenon, we asked her to keep track of how she uses the service in her daily life. Online trading is taking off in Japan, but, thanks to onerous government and industry regulations, widespread US-style daytrading will have to wait. He's been with big companies, done big things. 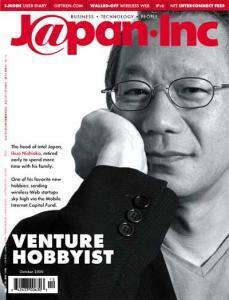 Now he heads up the biggest free ISP in Japan, livedoor. But can a free ISP survive when dot-coms everywhere are dropping like flies? From online forum moderator to CEO of successful tech integrator Gluegent, this 28-year-old says if you can't buy it off the shelf, just make it yourself. His "Model J" approach to management could lead Japan out of its technological wilderness and change the world's perception of the nation's innovative capacity. This businessman/author says his meishi-exchange service is truly new, and he wants to make it a global multilingual service from Japan. People think the Net happens on top of voice. It's the other way around. Voice is part of the Net and will eventually become free. Japan's desire for lifelong learning presents major business opportunities. What time of day do most Japanese surf? Japan dominates in videogames, but wireless and broadband are changing the rules. Who will rack up the points now? Giftken.com hopes its service will be well received in a gift-giving nation. eCrossing is betting that world-class management, an innovative incubation model, and plenty of Japanese experience will make it the idealab of Japan. Silver Egg Technology claims its AIgent gets to know you well enough to make shopping recommendations that aren't inane. Some interesting companies we're keeping an eye on. A Terrific Italian Restaurant in Tokyo Run by a 30-Year-Old "Iron Chef." "Sharing options" is what an art form called renga is all about. The inside poop on TOTO's Washlet, the i-mode of the commode industry.